Time for another working lunch in Cirencester and as the sun hadn’t quite made an appearance it was decided a brisk short walk was the best option in our quest for food. We headed out of our office on Dyer Street and two minutes later were inside the Malt and Anchor on Castle Street. As it had just struck twelve o’clock we were the first in and had the luxury of choice of table and I was able to take some photos without capturing any other diners. This was short lived as there were soon many happy customers tucking into fish and chips and Prosecco (which if you go on the right day and time is part of a deal for two – very appealing!). 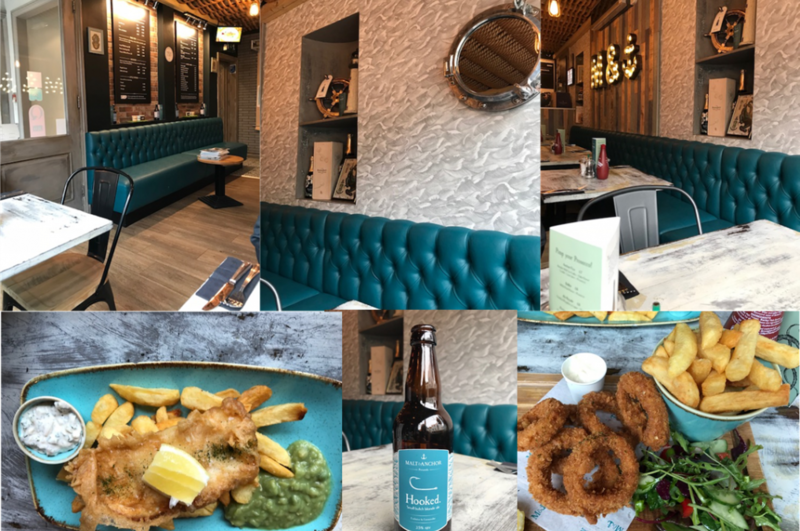 This 2018 best newcomer award winning fish and chip restaurant has a great menu and whilst Ian chose the ‘light bite’ traditional fish and chips with mushy peas I chose panko coated calamari, which is hand-cut squid rings coated in a coarse Japanese breadcrumb with chips, mixed leaves and a garlic aioli dip. Now I am not saying I talk a lot but more an indication of how tasty lunch was that Ian’s plate was clean and I was still savouring the calamari. Squid rings can sometimes seem a bit chewy but this had to be one of the best calamari I have tasted, great for anyone with dentures! I couldn’t resist sinking the twice cooked chips into the garlic dip but I hear there were some complaints in the office later that afternoon and my work colleagues had rather I’d left it untouched. It was a first time for Ian coming to this restaurant and I did feel a little guilty as apparently his wife has this place on her next to do list. With that I am confident he will be back very soon or at the very least be making use of their takeaway option!